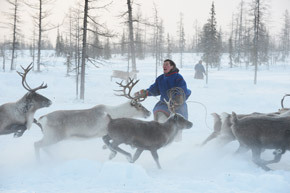 Reindeer herder competitors for the Cup of Governor Dmitry Kobylkin in the Yamal-Nenets Autonomous District in a nomadic camp rounding up deer on March 3, 2013. Reindeer herder competitors for the Cup of Governor Dmitry Kobylkin in the Yamal-Nenets Autonomous District in a nomadic camp rounding up deer on March 3, 2013. Source: Sergey Rusanov/RIA Novosti.